I completely adored the first book, Daughter of Smoke and Bone, and have this beauty sitting on my shelf just begging to be read. I'm so in love with Laini Taylor's writing; her world building, unique characters and writing style are all so beautiful. I can't wait to see what happens next with Karou and Akiva's story! Karou is one of my all time favorite main characters, I love her spirit and wit! My review of Daughter of Smoke and Bone. I have been hearing about this book everywhere! Whether it's on book blogs, booktube and even tumblr, everyone has something amazing to say about Eleanor and Park. It's in two point of views and it takes place in the 1980's, how much more awesome could it get?! It's about a unique first love and I've also heard incredible things about Rainbow Rowell's writing, I cannot wait to read this one! I know, I'm horrible. I still haven't read Insurgent! With the final book in the trilogy coming out earlier this Fall and all of the buzz surrounding the upcoming movie I've been regretting not reading this sequel already. I really love the first book, Divergent, and was thrilled to read book two, but somehow haven't picked it up yet. Yeah, I have know idea how it's been sitting on my shelf for over a year and still goes unread! I picked up the first book in this trilogy, Why I Let My Hair Grow Out, randomly at Borders one day and it sat on my shelf for a good year or so. As part of a read-a-thon, to help dig into my tbr pile, I decided to read it and see how it went. Oh my goodness it was amazing! I love the main character's humor and it takes place in Ireland! I think book two will be in America, but hopefully there will still be touches of Irish-ness and more about Morgan's connection to fairies. It's a unique read that went between current day and the past, while also adding in a fantasy aspect, loved it! My review of Why I Let My Hair Grow Out. Being totally honest here, I have no idea what this book is about despite the fact that I've read the summary a few times now, I just keep forgetting! However I do remember that it was awesome and that I've heard great things about Enclave. I keep seeing it everywhere and was eyeing it the last time I went to the bookstore and now I'm having major regrets since I didn't buy it! All I know is I need to read this one and I need to read it now! Seriously, with the ending of Crewel, I can't believe I haven't bought and read this book yet. It was such a crazy turn of events at the end of the first book that I was left craving the (at the time) unreleased book two. I picked up the first book knowing nothing about it, other than the summary and the pretty cover, and ended up absolutely loving it. The main character has the ability to weave time (how awesome is that?!) and she's taken away from her family by the government along with other spinners to weave under their watchful eye. I think book two, Altered, will definitely offer something totally different than book one, but will still be just as awesome as the first! I know, I know. The Delirium trilogy (or at least the first two books in the trilogy) are some of my all times favorite books. I'm absolutely in love with Lauren Oliver's writing, but I've heard mixed reviews on the last book, Requiem. Also, I'm one of those people that just doesn't want to let go of my beloved characters and since this is the last book in the trilogy, I'm already upset that it's going to be over! I have this on my nightstand so I have a feeling this will be the next book I'll be reading, I'm excited and nervous all at the same time! This is another book where I'm super nervous to see what happens next and let these characters go. If I Stay holds such a special place in my heart that I'm nervous the second book, Where She Went, will let me down. Even despite the fact that I've heard this book is even better than the first. I also need to prepare myself (a.k.a. with tissues for my tears) because I balled during the first book. I know it's going to be amazing and then once I finally read it, I can start on Gayle Forman's other series, Just One Day. My review of If I Stay. Two words: parallel universe. AH! I need to read this immediately! What really got me pining over Parallel was Sana's (Artsy Musings of a Bibliophile) review, which you can check out here. The main character had dreams of going to Northwestern and majoring in journalism, but things aren't going as planned. A part of the summary says "Abby must let go of the Plan and learn to focus on the present." Holy cow!! I need to read this book, I think it will be absolutely perfect for me and will teach me a much needed lesson at staying in the present and embracing the unknown! 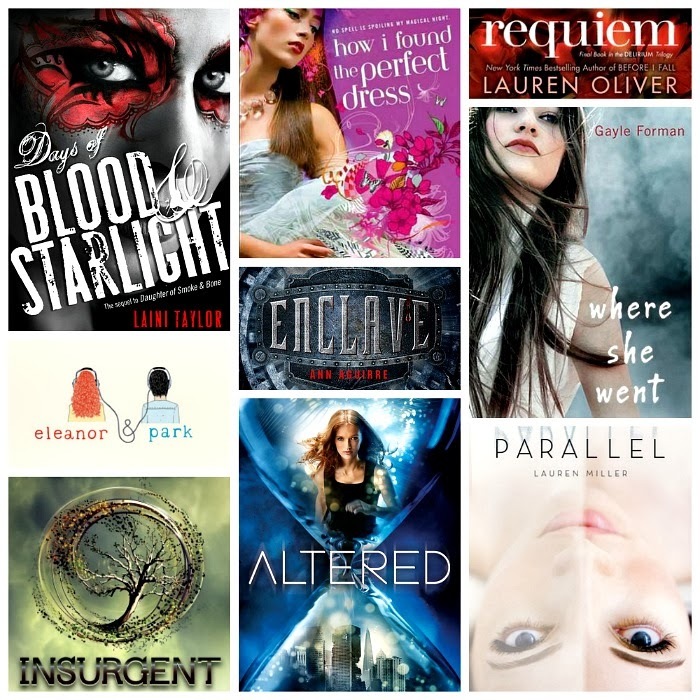 I'm hoping to read insurgent and Eleanor and Park soon too! And I absolutely loved Where She Went. I read it in a day and remember enjoying every minute of it. Happy reading!